Discover luxurious and effective skincare with the Give Kindness Set from Kora Organics. Combining three nourishing products bursting with natural ingredients, the set contains everything you’ll need for clean, hydrated, glowing skin. Comes with an exclusive beauty bag to hold your new treats. 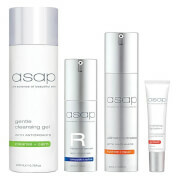 Refine and polish your skin with a gel-based exfoliator that leaves the whole body glowing. Enriched with a powerful blend of Lemongrass, Bergamot, Orange and Mandarin Essential Oils, the formula gently lifts away, dirt, excess oils and impurities and gives skin a thorough clean, resulting in a smooth, supple complexion. Boost radiance and hydration with a lightweight treatment oil that strengthens the skin without leaving a greasy residue. Absorbing effortlessly, the formula provides the body with a powerful blend of antioxidants and Essential Fatty Acids (EFAs), which help to protect skin tissues against damage. Moisture is replenished and the complexion is balanced for super-soft, ultra-clear skin. Turn back time with a daily hand and nail cream infused with anti-ageing ingredients. Avocado, Olive Oil and Noni Extract work together to heal dry, damaged skin and restore vital moisture, as well as softening cuticles. Hands are left smooth, supple and noticeably younger-looking. Keep your beauty products safe in this exclusive cosmetics bag. Free from parabens, sulphates, synthetic colours and fragrances and silicones. Organic. Not tested on animals. Body Exfoliator: Exfoliate every second day. Gently massage the kora organics body exfoliator onto damp skin using circular motions focusing on areas that tend to be rough (heels, knees, elbows), then rinse. For beautiful silky-smooth skin follow with kora organics enriched body lotion. Hand Cream: Apply a small amount continually throughout the day to form an invisible protective layer that helps nourish and protect your skin. Massage well into the back of the hands and cuticles. Body Exfoliator: Aloe Barbadensis (Aloe Vera) Leaf Juice*, Decyl Glucoside, Rosa Centifolia (Rose)* And Camellia Sinensis (Green Tea) Extract*, Diatomaceous Earth, Coco-Glucoside, Glycerin^, Sodium Cocoyl Glutamate, Glyceryl Oleate, Xanthan Gum, Bambusa Arundinacea (Bamboo) Stem Extract, Morinda Citrifolia (Noni Fruit) Extract*, Tocopherol (And) Helianthus Annuus (Sunflower) Oil, Lactic Acid, Citrus Sinensis (Orange) Oil*, Citrus Aurantium Ssp.Bergamia (Bergamot) Oil*, Citrus Reticulata (Mandarin) Oil*, Cymbopogon Flexuosus (Lemongrass) Oil*, Parfum (Natural), Benzyl Alcohol, Dehydroacetic Acid, Limonene**, Linalool**, Citral**. *Ingredient from Organic Farming. **From Essential Oils. Body Oil: Rosa Canina (Rose Hip) Oil*, Dicaprylyl Carbonate, Tocopherol (And) Helianthus Annuus (Sunflower) Oil, Punica Granatum (Pomegranate) Oil*, Morinda Citrifolia* (Noni Fruit), Fragrance (Natural Parfum), Limonene**, Eugenol**. *Ingredients from Organic Farming. **From Essential Oils. Hand Cream: Lavandula Angustifolia (Lavender)*, Matricaria Chamomilla (Recutita - Chamomile)*, Olea Europaea (Olive) Leaf*, Fucus Vesiculosus (Bladderwrack) Extract*, Aloe Barbadensis (Aloe Vera) Leaf Juice*, Macadamia Integrifolia (Macadamia) Seed Oil*, Olivoyl Hydrolyzed Wheat Protein, Glyceryl Oleate, Cetearyl Alcohol, Glyceryl Stearate, Olea Europaea (Olive) Oil, Glycerin^, Morinda Citrifolia (Noni Fruit) Extract*, Glyceryl Stearate SE, Rosa Eglentaria (Rose Hip) Oil*, Tocopherol (And) Helianthus Annuus (Sunflower) Oil, Punica Granatum (Pomegranate) Sterols, Carageenan, Santalum Spicatum (Sandalwood) Oil*, Citrus Reticulata (Mandarin) Oil*, Citrus Paradisi (Grapefruit) Oil*, Sodium Hyaluronate, Lecithin (GMO Free)*, Ascorbyl Palmitate (Vitamin C), Citrus Aurantium Ssp Bergamia (Bergamot) Oil*, Sodium Chloride (Macrobiotic Sea Salt), Beta Carotene, Benzyl Alcohol, Dehydroacetic Acid, Potassium Hydroxide, Lactic Acid, Xanthan Gum, Aqua (Water), Limonene**, Linalool**. *Ingredient from Organic Farming. **From Essential Oils.